The largest tract of preserved green space - the Pittsfield Preserve at approximately 500 acres - is located in this region along with one of the Township’s most vibrant parks (Lillie Park), and a family-operated farm that incorporates agri-tourism. Public facilities, including the Township Administration campus, are located here. There are diverse residential neighborhoods within this area, including one of the largest subdivisions in the Township and several condominium complexes. 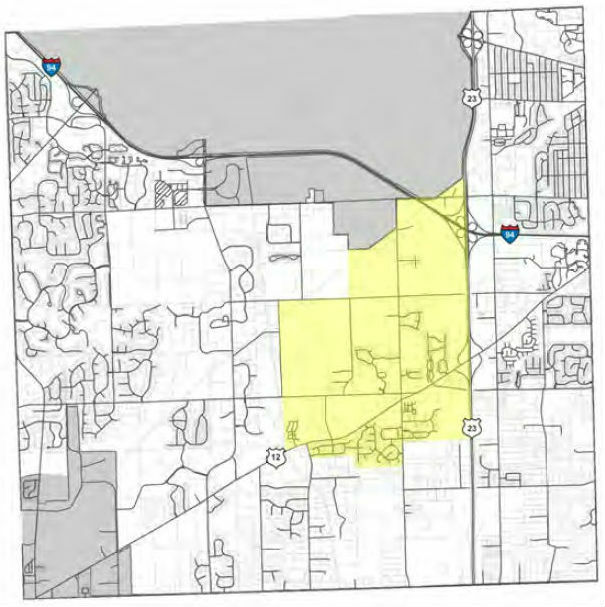 Even though the Township’s first non-motorized pathway, the Platt Road Greenway is located in this area, there is a scarcity of non-motorized options. There is also a lack of public transit, particularly along Michigan Avenue. There is a need to revitalize the area along Michigan Avenue between Platt Road and the US-23 interchange not only to enhance one of the major gateways into the Township but also to leverage opportunities for infill development.